Chief Scout Gold Award for Matthew! 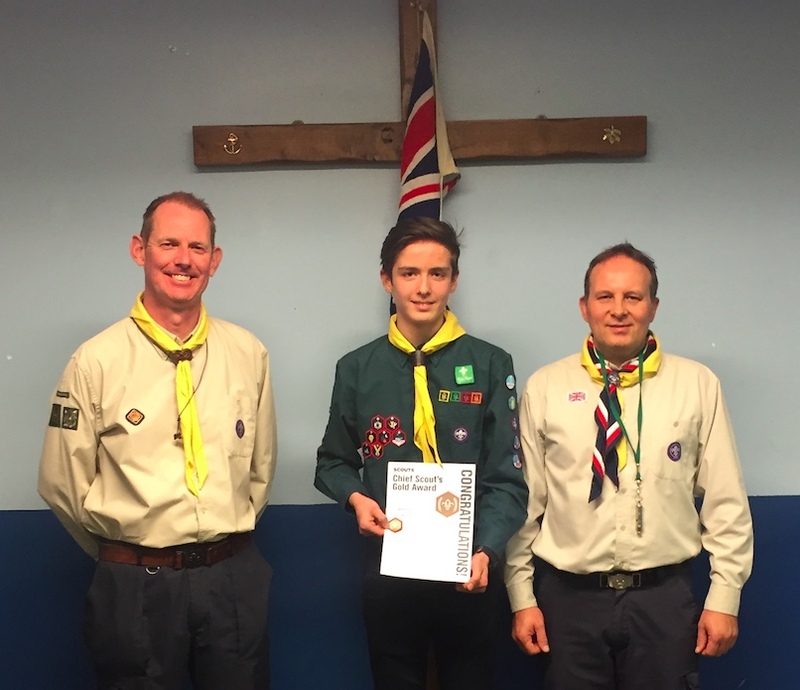 At the end of March, we had a visit from Geoff Barnes the District Commissioner for Loddon Scouts, to present a Chief Scout Gold Award to Matthew Savin. This is the highest award in Scouting and represents a significant personal achievement. Over the last four years Matthew has diligently attended nearly every Monday evening session and has attended a number of camps and hikes. Matthew has also represented 1st Wargrave on the Great Breakfast Chase an overnight Incident hike on many occasions. Geoff highlighted the significant amount of effort required to complete all of the nine Challenge badges (Adventure, Expedition, Personal, Creative, Teamwork, Team Leader, Team Skills, World and Outdoors). Our rotating term-based programme is built around the curriculum for all of these badges. It’s a lot of hard work and the Leaders (Richard, Annie and myself) are very proud of Matthew’s efforts and the contribution he has made to the troop, a job well done! Our Summer Term starts after the Easter break on Monday 29th April with an outdoor cooking and wide games evening. Scouts will also be practising pitching patrol tents and planning activities for our stall at the Festival Fete. After the May half term we have our popular “Chip Shop Hike” from Dinton Pastures along the River Loddon to Tywford. A full programme for the Summer Term will be issued after Easter. To find out more about Wargrave Scouts, please follow us on Twitter. Over the next 12-18 months we have a number of Leaders retiring and moving-on from 1st Wargrave Beavers, Cubs and Scout sections. This means that we will be looking for a new team of volunteers to come forward to maintain Scouting in the village. We are also on the lookout for people to join as trustees on our Exec Committee which organises social events and maintains our charity finances. If you are interested in providing young Wargravians with the opportunity to experience the outdoors and help them grow and develop life-long skills, please do get in touch by emailing: gsl@wargravescouts.org or speak to Pete Fry the 1st Wargrave Group Scout Leader.